Thanks for a successful meeting on February 9, 2019! Check out our 2019 Photo Contest Winners! Our June 2018 trip to Otero County was a great success with 152 observations and 30 species found! Letters from Phoenix Herpetological Society (PHS)! The letters were written by young students who attended the summer camp at PHS last year. These students chose COPARC to contact about reptile conservation. 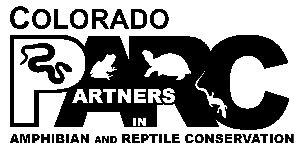 Colorado Partners in Amphibian and Reptile Conservation (CO PARC) is a state chapter of Southwest PARC (SW PARC), a regional working group of national Partners in Amphibian and Reptile Conservation (PARC). PARC is an inclusive partnership dedicated to the conservation of herpetofauna–reptiles and amphibians–and their habitats. Its membership comes from all walks of life and includes individuals from state and federal agencies, conservation organizations, museums, pet trade industry, nature centers, zoos, energy industry, universities, herpetological organizations, research laboratories, forest industries, and environmental consultants. Colorado PARC is organized for the purpose of implementing the PARC mission within Colorado. Our state is home to 18 amphibian and 53 reptile species that occupy the Great Plains, Rocky Mountains, and western plateaus and canyons. Like the Southwest, Colorado faces a number of conservation challenges, including ongoing drought and water resource consumption, habitat destruction, and the introduction of crayfish, bullfrogs, and non-native fish into amphibian and reptile habitat. Although we are a state chapter of PARC, we welcome our neighbors and friends from all over to become active participants in Colorado amphibian and reptile conservation. The Venom Interviews from Ray Morgan on Vimeo.